We reprint below a protest statement by the Internationalist Group in defense of the courageous Bangladeshi writer Taslima Nasrin. In 1994 Nasrin was forced to leave her country after Muslim fundamentalists issued a fatwa (religious edict) calling for her death, charging her with blasphemy for declaring that Islam was oppressive to women. A price was put on her head. The “secular” government authorities of Bangladesh pitched in by confiscating her passport, arresting and charging her under an obscure law, dating from British colonial times, against “insulting” religion. When she escaped the country in 1994, religious bigots were mobilizing massive lynch mobs with the demand that she be hanged. After escaping to exile and living in Europe and the United States, Nasrin returned to Bangladesh in September, hoping to avoid the spotlight and be with her mother, who is dying of cancer. However, she was recognized and her presence in the country was publi­cized, touching off another escalation of the threats against her life. Today, defending this brave and eloquent voice against oppression is more urgent than ever. Taslima Nasrin’s cause is controversial among many women’s groups in Bangladesh who view her as an embarrassment to the regime of liberal woman prime minister Sheikh Hasina Wajed, who panders to the Islamic fanatics. The country’s bourgeois rulers also see Nasrin’s views – a mixture of radical secularism, feminism, nationalism and broad sympathy for the goals of socialism – as a threat to their relations with the imperialist agencies and banks that fund “women’s investment projects” in Bangladesh. But the sheikhs and banks and media do not speak for, and indeed are the enemies of, oppressed women. Thus it was reported that in June 1994 some 500 women garment workers in Dhaka, the nation’s capital, armed themselves with sticks and marched in defiance of the fundamentalists and in defense of Nasrin, stressing that in doing so they were defending their own basic rights. Even some bourgeois feminists in the West have been queasy about defending Nasrin because of her forthright praise of Lenin. Although she is not a revolutionary Marxist, she recognized that the destruction of the Soviet Union (which she wrongly equated with socialism) represented a tremendous blow to women. She wrote an essay favorably quoting, one after another, many of Lenin’s calls on the whole of the workers movement to take up the cause of the liberation of women, to integrate women in socially productive labor and as dedicated fighters in the revolutionary struggle for workers rule. Nasrin herself is essentially a secular humanist rather than a communist, but the issues raised by her case and in her writings highlight the urgent need for a Leninist party of the proletariat that will serve as “tribune of the people” against every form of oppression. In the countries of the East and throughout the semi-colonial world, the program of such a party must base itself on Trotsky’s perspective of permanent revolution, a key component of which is the fight to mobilize the working class in revolu­tionary struggle for the emancipation of women. The Internationalist Group/League for the Fourth International protests the threats of capitalist state repression and fundamentalist vigilante terror against Taslima Nasrin. The valiant Bangladeshi novelist and poet is renowned for her impassioned defense of women’s rights and her writings on subjects ranging from V.I. Lenin to the horrors of communalist fratricide. While Islamic fundamentalists have put a price on her head and seek to whip up lynch mobs against her, government authorities have threatened to arrest Nasrin for the “crime” of telling the truth about the role of religious fundamentalism in the brutal oppression of women. Her life is in more danger than ever since she returned to Bangladesh to be with her terminally ill mother. Defend Taslima Nasrin! Her case is not only a question of crucial and basic democratic rights, but of the fight for women’s emancipation and the interests of the entire working class in Bangladesh (where women’s oppression is a key tool for chaining the largely female proletariat) and throughout the Indian subcontinent. Her denunciation of the communal bloodletting that pits Hindus against Muslims points to the burning need to overcome the religious, ethnic and national antagonisms that divide the region’s potentially powerful working class. As revolutionary internationalists, we demand that the government and the clerical reactionaries keep their hands off this courageous writer. Far from being her protectors, the rulers of Bangladesh will be responsible if any harm comes to her. Western imperialist spokesmen (like U.S. vice presi­dent Gore on his recent trip to Malaysia) make hypocritical references to “human rights” abuses in various Islamic countries, and some have even claimed sympathy for Nasrin’s plight. Yet in the United States and Europe, the imperialists have sought to whip up bigotry and hysteria against Muslims and Arabs as part of their “anti-terrorism” witchhunts. Meanwhile, at home the U.S. ruling class is trying to use the racist death penalty to silence another courageous and outspoken writer: Mumia Abu-Jamal, the radical black jour­nalist and former Black Panther on Pennsylvania’s death row. The struggle against bourgeois repression is truly an international one, posing the need for an internationalist program and leadership to unite the workers and oppressed, from the Indian subcontinent to the Chinese masses threatened with capitalist restoration to the industrial powerhouses of Japan, Europe and the United States. 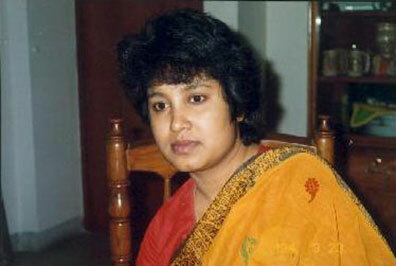 The working class internationally must champion the defense of those such as Taslima Nasrin as part of the struggle for the socialist revolution, the only means of doing away with the enslavement and degradation of women and every form of oppression and exploitation.